Standing firm on the Second Amendment, Sen. Ted Cruz (R-Texas) said at a pro-gun event Saturday that the atrocities in South Carolina proves the need for the death penalty, not greater gun control. At a “Celebrate the 2nd Amendment” event held in Johnston, Iowa, Cruz said that Charleston shooter Dylann Roof should receive the death penalty. “Gov. Nikki Haley in South Carolina said this individual who committed the heinous murder in South Carolina should be subject to the death penalty. I got to say the death penalty was designed for people who commit horrid crimes like this,” Cruz told The Des Moines Register. Cruz said the goal of all gun laws should be to stop criminals, not law-abiding citizens, from obtaining firearms. 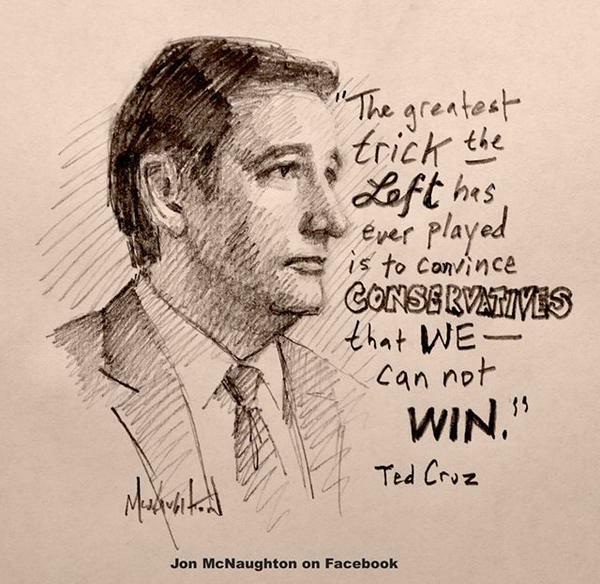 I have to say that Ted Cruz is the candidate that I like best. The fact that he’s of Cuban extraction might be of use to draw the latino vote to the Republicans as well, which would really rip the Democrats nighties after they’ve gone to the trouble of letting Mexicans flood across the border illegally, & given them amnesty so they will vote Democrat. Probably not, but you never know. Yes, he’s also had the good sense to come out against Obamatrade. Finally. The goal of gun laws must be to ensure all law-abiding citizens (as well as police) do their part in preserving freedom and justice. In this case, there’s no excuse for the cops not just shooting the guy down.